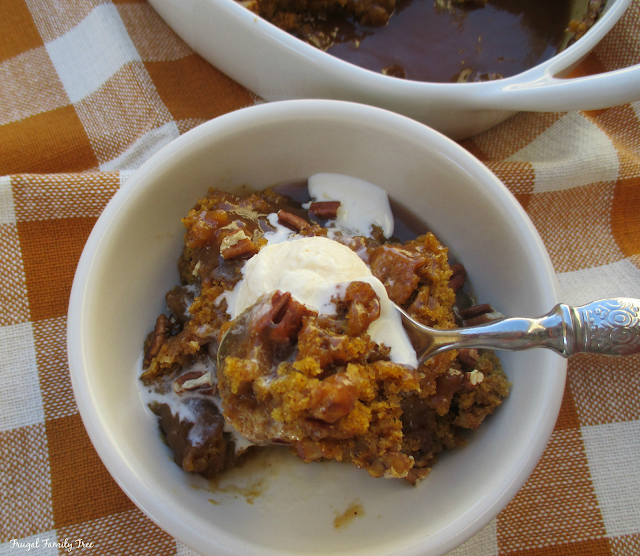 If you're a pumpkin dessert lover than this is one recipe that you will simply fall in love with. It's truly that good. 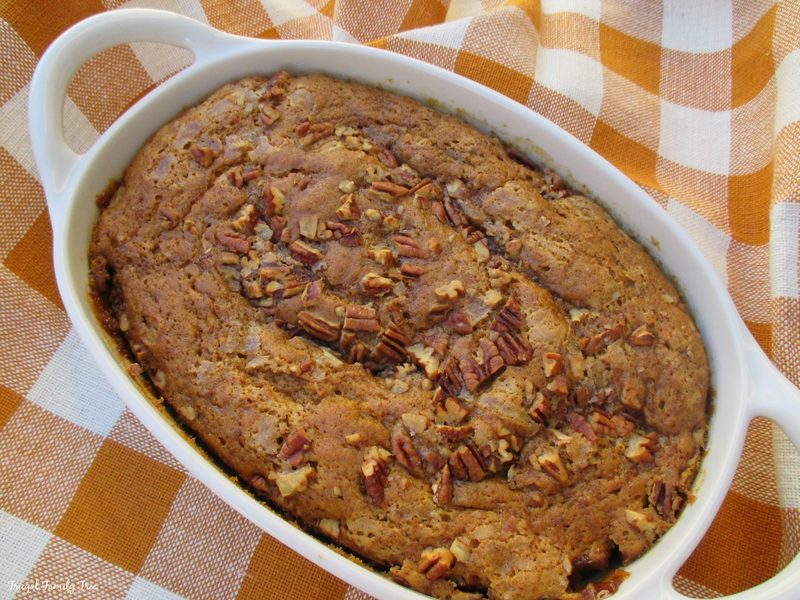 It's sweet and spicy, and has a rich pumpkin flavor that simply can't be beat. I found the recipe last year over on Lauren's Latest blog and finally got around to making it yesterday. And boy am I glad because this one is a keeper. 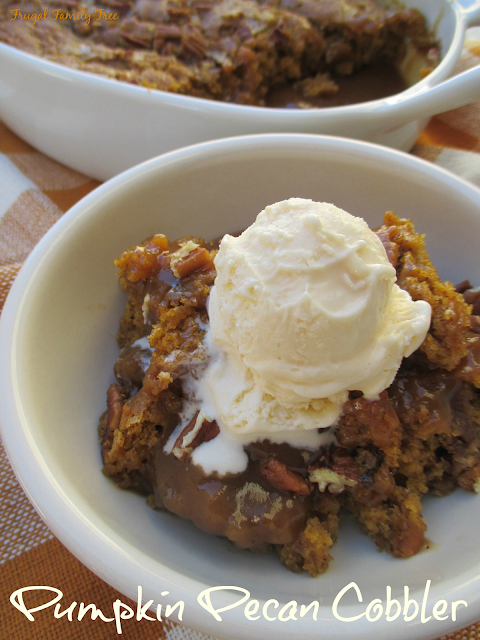 I'm going to make it again, doubling the recipe and serve it on Halloween night for dessert. We have family and a couple of neighbors coming over after trick-or-treating, and I know they'll love this. It's an easy recipe that most home cooks and bakers have the ingredients on hand for in the pantry already. The exception might be the canned pumpkin, but if you're anything like me, you have already stocked up with lots of cans in preparation for fall and winter baking. 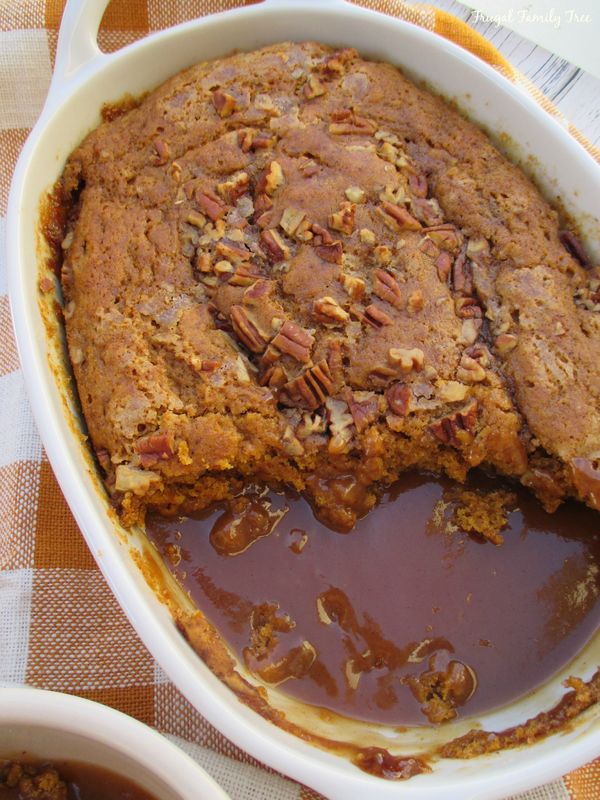 Here's the crazy thing about this recipe, the thing that made me wonder if this dessert would really turn out right. After you make the batter and topping and spread it in the baking dish, you pour HOT WATER on top of it. And you don't stir it but simply put it into the oven. Somehow that hot water works it's magic and turns into a rich caramel flavored sauce that can be spooned over the top. 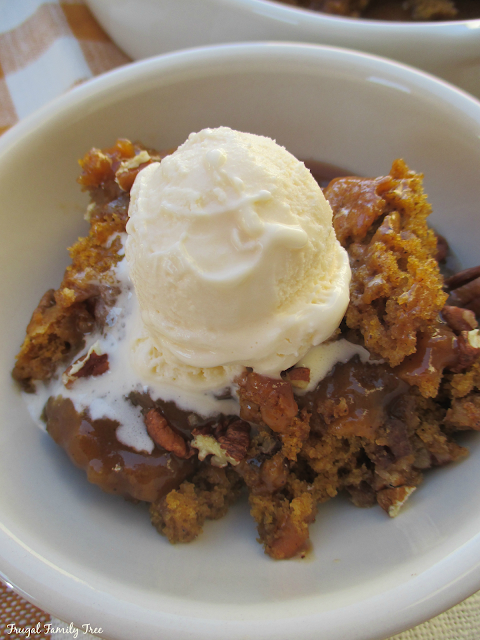 And it's perfect with vanilla ice cream and added pecans. Preheat oven to 350 degrees. In a medium sized bowl, stir together flour, baking powder, salt, sugar and spices. Set aside. In a smaller bowl, stir pumpkin, milk, melted butter (or vegetable oil) and vanilla together to combine. Pour wet ingredients into dry ingredients and mix to create a thick batter. Pour into a 8-inch casserole dish with high sides. In a separate bowl, stir sugar, brown sugar, and pecans together. Spread evenly over top of batter. Pour hot water over all of it. DO NOT STIR. Bake for 40 minutes or until the middle is set. Serve warm. Add vanilla ice cream and additional pecans if desired.